ENCISO, Lynette A. - (Balangiga)- Dr. V. Orestes Romualdez Educ. Foundation Inc.
Underscoring the need to revitalize the livelihood activities of the typhoon Yolanda-affected low-income families, the Department of Science and Technology-Region 8 (DOST-8) thru the DOST-Eastern Samar Provincial S&T Center (PSTC-Eastern Samar), has bolstered its efforts to establish science and technology based processing facilities by spearheading several projects under the Community Empowerment through Science and Technology (CEST) Program for the province of Eastern Samar. 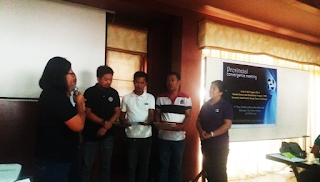 During the recently held Provincial Convergence Meeting in Boro Bay Hotel, Borongan City, PSTC Eastern Samar initiated the formal turnover of project funds amounting to Php 3,498,382.00 to five proponents: Eastern Samar State University (ESSU) – Guiuan Campus, ESSU-Salcedo Campus, LGU-Quinapondan, ESSU-Maydolong Campus and ESSU-Main Campus, Borongan City. In addition, DOST-8 also released PhP 400,000.00 to ESSU-Can-avid Campus for the establishment of organic fertilizer production center and LGU-Arteche for livestock feeds production. These livelihood funds granted to the recipients are part of the total allocation from DOST-NDRRMC Yolanda Rehabilitation and Reconstruction Program (YRRP) and the DOST-8 Grants-in-Aid Program. 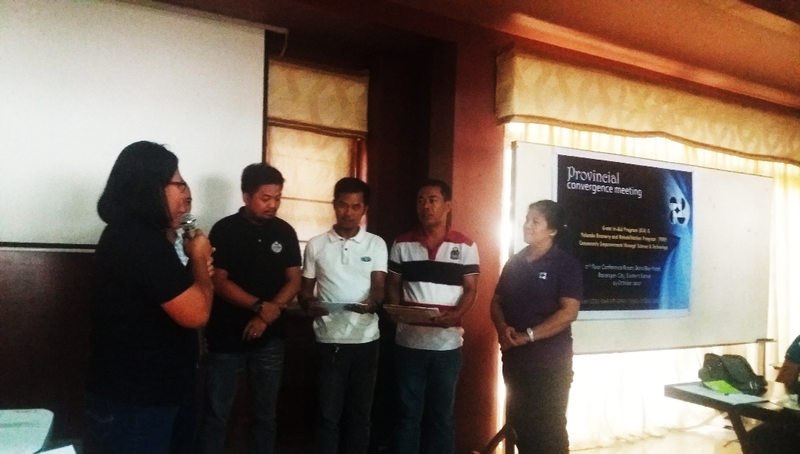 The hand-over of funds were witnessed by Dr. Lucia P. Dauz, DOST-8 Regional GIA Coordinator, and assisted by Engr. Alfie Nino Bongasia, Coordinator for YRRP Projects and Engr. Blenda Aserios, Provincial YRRP Project Assistant. Engr. Emiel Prisco N. Discar, SRS-II and Provincial Coordinator for the GIA and YRRP Projects, stressed that grant funds from DOST-NDRRMC and DOST-8 GIA are expected to provide livelihood opportunities to more than 500 low income families in eight municipalities affected by the Super Typhoon Yolanda last November 8, 2013 and Typhoon Ruby last December 6, 2014. The funds are intended for technology acquisition, product packaging and labeling development, consultancy for productivity improvement and technology trainings for the following projects: establishment of meat processing facility, high value crops processing, cacao nibs processing, veggie noodles processing, tuna fish processing in the municipalities of Mercedes, Salcedo, Quinapondan, Hernani, and Maydolong respectively. Products are expected to be sold not only to the general public but also in support to the nutrition program of DOH, DSWD and DepEd and in support to the agriculture productivity projects of DA, OPAS and LGU-Eastern Samar. Furthermore, Dr. Dauz, led the discussion on the Implementing Guidelines for the Grants-In-Aid and YRRP projects, emphasizing the system of procurement and donations of technology equipment, proper preparation of liquidation and periodic reports and other salient features in the memorandum of agreement. The activity was actively participated by the different stakeholders as represented by the Directors for Extension Services and Accountants of the five (5) ESSU Campuses, Municipal Agriculture Officers and Accountants, representatives from people’s organization, representatives from the Provincial Offices -Department of Trade and Industry (DTI), Department of Agrarian Reform (DAR) and Office of the Provincial Agriculture Office Services (OPAS). All of them expressed their support especially on the complementation of agency’s resources for sustainability of the projects. “When united there is strength” said Dr. Vicente V. Agda, the Director for Extension Services, who also extended his gratitude to the DOST in behalf of the ESSU Campuses for being recipients of the S&T community projects. have not previously taken the PSHS-National Competitive Examination. Certification or proof that the applicant belongs to the upper 10% of the graduating class if the final grades in Math and Science are below 85%. Only one test will be administered, a Scholastic Aptitude Test (SAT) consisting of tests in Scientific Ability, Quantitative Ability, Abstract Reasoning and Verbal Aptitude. Application Forms and Brochures are available at all DOST Regional Offices and Provincial S&T Centers, PSHS campuses, DepEd Division Offices and Offices of School Principals. The forms can also be downloaded from www.pshs.edu.ph. Application forms and other requirements can be submitted to the PSHS-Registrar’s Office in Diliman, or to any Regional PSHS Campuses, or to the DOST Regional Offices and Provincial S&T Centers. Deadline for filing of applications is on September 1, 2017 (Friday) while the examination will be conducted on October 21, 2017 (Saturday) at the Eastern Samar National Comprehensive High School (ESNCHS), Borongan City, Eastern Samar. The Philippine Science High School is one of the attached agencies of the DOST contributing to the expansion and development of the country’s scientific and technological manpower. The PSHS has eight campuses nationwide, one of which is the Eastern Visayas Campus located in Candahug, Palo, Leyte. For more information, please visit the DOST–E. Samar Provincial S&T Center, ESSU Campus, Borongan City or call/text mobile numbers 0918 515 9990, 0917 713 2799 or 0926 518 9847. The Department of Science and Technology formally announces the availability of scholarship slots for the 2018 DOST Science and Technology Undergraduate Scholarship Programs for graduating senior high school (Grade 12) students nationwide who wish to pursue baccalaureate degree programs in Basic Sciences, Science Teaching, Engineering and other Applied Sciences. Among the benefits of DOST scholars are: P3,200-P6,000 monthly stipend (depending on the course), P10,000 for tuition fees/semester, P5,000 book allowance/semester, transportation and clothing allowances. DOST-SEI Merit Scholarship Program, for applicants whose family’s socio-economic status exceeds the set values of certain indicators. A non-refundable test fee of P200.00 is required. pass the S&T Scholarship Examination. The application forms and brochure can be obtained from the DOST-E. Samar Provincial S&T Center, DepEd Division Offices and Office of the School Principals in all public and private senior high schools in the province. The same forms can be downloaded from the website www.sei.dost.gov.ph. Accomplished application forms and other requirements must be submitted to the DOST–E. Samar Provincial Science & Technology Center, DOST Bldg., ESSU Compound, Borongan City, Eastern Samar on or before August 25, 2017 (Friday). The examination will be held on October 15, 2017 (Sunday) in at least two (2) Testing Centers in the province which will be announced later. For more information, please visit our office or call/text us using mobile numbers 09185159990, 09177132799 or 09265189847.